The Patient Protection and Affordable Care Act (ACA) of 2010 expands health insurance coverage to a substantial number of persons without health insurance. In California, Latinos, especially Mexican immigrants, have one of the highest rates of uninsurance, making the ACA particularly important for that group. 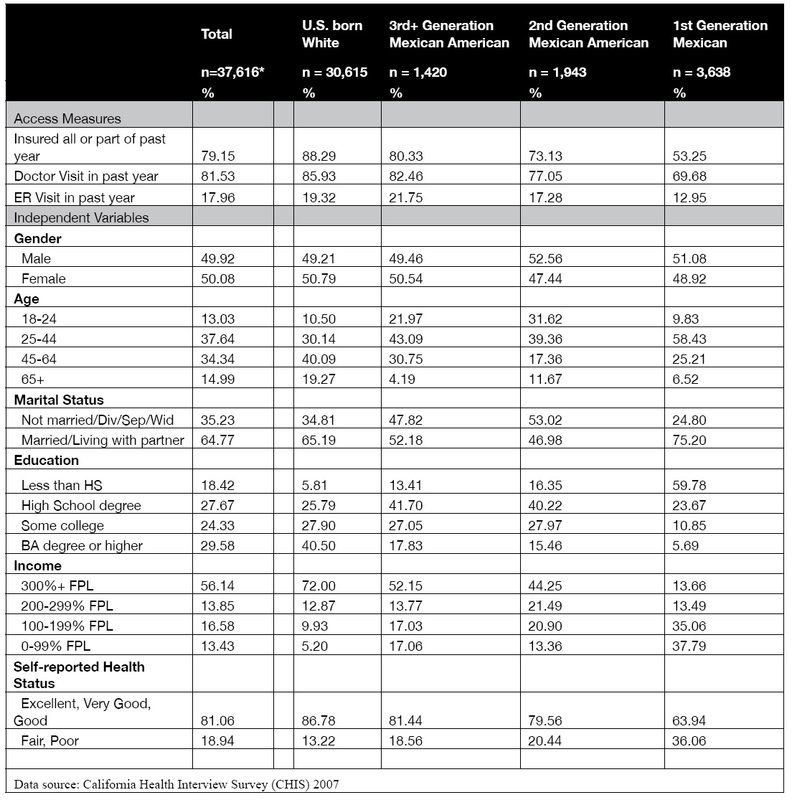 Using the 2007 California Health Interview Survey, this study examines how the generation in the U.S. of individuals of Mexican-origin is associated with their access to health insurance, doctor visits, and emergency room visits in California compared to that of U.S.-born non-Latino Whites. Results indicate that third generation Mexican Americans have similar levels of being insured, having a doctor visit, and having an ER visit compared to Whites, controlling for demographic, socioeconomic, and health status. First generation (immigrant) Mexicans have the least access to health care services with lower odds than Whites of accessing care across all measures. Second generation Mexican Americans also have lower odds than Whites, however, the differences are not as pronounced as for the first generation. This study finds that there are important differences in access to health care among Mexican Americans by generational status, with the greatest disparities for the generations closest to the immigrant experience. Implementation of the ACA will benefit Mexican Americans across generational statuses, but gaps will likely remain for first and second generation Mexican Americans. Le Patient Protection and Affordable Care Act (ACA), voté en 2010, étend la couverture d'assurance-maladie à un grand nombre de personnes qui en étaient jusqu’à présent dénués. Cette loi est particulièrement importante pour les Latinos de Californie, et en particulier pour les immigrés mexicains, le groupe ethnique qui présente l'un des taux de non-assurance les plus élevés. En se basant sur l'enquête 2007 California Health Interview Survey, cette étude examine le lien entre la génération des individus d'origine mexicaine vivant aux Etats-Unis et leur accès à l'assurance-maladie, aux médecins et aux urgences en Californie comparé aux Blancs non latinos nés aux Etats-Unis. Les résultats indiquent que les Américains d’origine mexicaine de troisième génération ont des taux similaires de non-assurance, de visites chez le médecin et de visites aux urgences à ceux des Blancs, pour des statuts démographique, socioéconomique, et de santé comparables. Les Mexicains de première génération (immigrants) sont ceux qui ont le moins accès aux services de santé avec moins de chances que les Blancs d'accéder aux soins pour tous les groupes de mesures. Les Américains d’origine mexicaine de deuxième génération ont également moins accès aux soins que les Blancs mais les différences sont moins prononcées que pour la première génération. Cette étude montre qu'il existe des différences notables au niveau de l'accès aux soins entre les Américains d’origine mexicaine en fonction du degré de génération, les disparités les plus importantes concernant les générations les plus proches de la date d'arrivée dans le pays. L'application de l'ACA va bénéficier aux Américains d’origine mexicaine des différentes générations mais des écarts vont probablement perdurer pour les première et deuxième générations. La Ley de Protección al Paciente y Cuidado Asequible (ACA por sus siglas en inglés) de 2010 amplía la cobertura del seguro de salud a un importante número de personas que carece de dicho seguro. En California, los latinos, especialmente los inmigrantes mexicanos, registran una de las tasas más altas de no-asegurados, lo que convierte a ACA en una ley especialmente importante para ellos. Usando la Encuesta de Salud de California de 2007, este estudio examina como la generación a la que pertenecen los individuos de origen mexicano en California afecta su acceso a seguro médico, a consultas médicas y a consultas en la sala de emergencias en comparación con los blancos no-latinos nacidos en Estados Unidos. Controlando demografía, nivel socioeconómico y estado de salud, los resultados indican que la tercera generación de estadounidenses de origen mexicano tienen un nivel similar de cobertura, consultas médicas y atención en salas de emergencias comparados con los blancos. La primera generación de mexicanos (inmigrantes) registra el menor acceso a los servicios de cuidados de salud y menor probabilidad que los blancos de acceder a cuidados en todas las categorías. La segunda generación de estadounidenses de origen mexicano también tienemenos probabilidades que los blancos, aunque las diferencias no son tan pronunciadas como en la primera generación. Este estudio concluye que existen importantes diferencias en el acceso al cuidado de salud entre los estadounidenses de origen mexicano dependiendo de la generación a la que pertenecen, con las diferencias más grandes en la generación más cercana a la experiencia migratoria.. La implementación de ACA beneficiará a las distintas generaciones de estadounidenses de origen mexicano, aunque probablemente sigan existiendo deficiencias para la primera y segunda generación. 1The passage of health care reform in 2010, known as the Patient Protection and Affordable Care Act (ACA), will potentially extend health insurance coverage to the majority of the currently uninsured United States (U.S.) population. Latinos, especially Mexican immigrants, have the highest rates of uninsurance, making the implementation of the ACA particularly important for this group. Yet many Latinos face a number of social and economic factors, in addition to health insurance, that shape their ability to access health services when they need them. California is home to the largest number of Latinos of Mexican-origin in the country, making it a natural location to investigate the range of issues they face in access to health care and in assessing the possible implications of the ACA. Limiting the analysis to one state also avoids the possible confounding of differences in state health policy with group-specific access issues. 2A key component of the ACA is to increase insurance coverage through a series of insurance exchanges and expansion of Medicaid (KFF 2011). In California alone, it is expected that 1.7 million of the total uninsured will be eligible to participate in the insurance exchanges and an additional 2.3 million will be newly eligible to receive Medicaid (Pourat, Kinane and Kominski 2011; Pourat, Martinez and Kominski 2011). Many Latinos, because of their high rates of uninsurance, stand to benefit from health care reform. In 2007, 30% of Mexican-origin Latinos in California had no health insurance, compared to 16% of all adults statewide (CHIS 2007). As California begins to prepare for the implementation of health care reform, there is a need to better understand the health care access patterns of the Latino population, particularly what factors, in addition to insurance, affect their access to health care. 3Immigrants often experience limited access to health care, which is especially true for Latino immigrants of Mexican-origin (Lara et al. 2005; Morales et al. 2002). Studies find that access to care increases for Latino immigrants the longer they are in the U.S. (Lara et al. 2005; Ortega et al. 2007; Wallace et al. 2008). Several reasons may account for the access barriers Mexican-origin Latinos experience. For example, recent immigrants are more likely to have jobs that do not provide insurance (Carrasquillo et al. 2000). Latinos, both immigrant and U.S.-born, have high rates of low socioeconomic status (Lara et al. 2005; Portes and Rumbaut 2001), which makes it impossible to privately purchase insurance and can result in other financial barriers, such as not being able to afford high out-of-pocket costs or losing a day’s wages to take off from work to seek care. Other barriers to accessing care include a lack of familiarity with the U.S. health care system, limited English proficiency, or documentation status (Cordasco et al. 2011; Vargas Bustamante et al. 2010). These obstacles to accessing care can differ in their impact and effect for each Latino subgroup. Latinos are a heterogeneous group with various demographic characteristics, such as immigrant status, time in the U.S., nativity, acculturation, and generational status, that can result in a variety of access patterns and barriers to health care. 4Recent research has begun to examine the role of generational status on health and access (Acevedo-Garcia et al. 2010; Afable-Munsuz et al. 2010; Burgos et al. 2005; Popkin and Udry 1998; Ta, Holk and Gee 2010). Generational status moves beyond the foreign-born versus U.S.-born dichotomy found in most research by disaggregating the U.S.-born into second, third and later generations since immigration. Immigrant health research typically focuses on the first (immigrant) generation, although there is a growing attention to the second generation (immigrants’ U.S.-born children) as well. Few studies examine the third generation, limiting our understanding of the impact of immigrant integration into mainstream society on health and access. In order to examine generational status and its association with access to care, this study focuses on Mexican Americans, which make up 83% of the Latino population in California (U.S. Census 2010) and have an established history in the United States with several generations in California (Pew Hispanic 2011). 5Traditional assimilation theory would posit that by the third generation the economic and social integration of Mexicans would make them mostly indistinguishable from the larger non-Latino population (Portes and Rumbaut 2001; Portes and Zhou 1998). However continued immigration from Mexico, the proximity of Mexico to the U.S., and the availability of resources and opportunities might create divergent patterns (Portes and Rumbaut 2001; Portes and Zhou 1998; Telles and Ortiz 2008). Segmented assimilation theory identifies alternate paths in the assimilation processes of Mexicans and other racial minority immigrant groups. A first path follows the classical route to assimilation in which immigrants are integrated into the mainstream and lose their ethnic identity, usually by the third generation; a second path involves upward economic mobility while also maintaining the group’s ethnic identity (Portes and Zhou 1998). An alternative course, downward assimilation, leads in the opposite direction in which the immigrant group retains an ethnic identity and faces barriers that cause socioeconomic stagnation and limited social mobility, resulting in high rates of poverty (Portes and Zhou 1998). 6Examining Latinos by generational status allows for a better understanding of the access of U.S.-born Latinos, as well as the level of integration into U.S. society for immigrants and the later generations. Generational status may serve as a proxy for the unique racial and immigrant experiences of Latinos, taking into consideration the larger social context that can facilitate or impede integration into the mainstream over time. Each generation may vary on several characteristics, such as in their levels of education, economic status, racialized experiences, place of residence, current and potential social mobility and social integration levels, all of which can impact access to health services. 7We draw on immigrant health research and sociological assimilation theories to better understand health care access for Mexican-origin individuals by generational status. Generational status is conceptualized as the number of generations the respondent is removed from the time of immigration (Rumbaut 2004; Telles and Ortiz 2008). Following Portes and Rumbaut (2001), this study defines first generation Mexicans as individuals born in Mexico currently living in the U.S., second generation Mexican Americans as U.S.-born individuals with at least one foreign-born parent, and third generation Mexican Americans as U.S.-born individuals with both parents born in the U.S. With cross-sectional data we are limited to examining generation since immigration as cohorts, as opposed to generations within families, which would directly link generation from parent to child to grandchild. This is an important distinction because although with generation since immigration we examine different generations, those cohorts have similar historical experiences (Rumbaut 2004; Telles and Ortiz 2008). Since we are not sampling by families we cannot measure intergenerational change, but instead examine changes by cohorts. 8This study has two aims. First, to examine how access to health care services for first, second, and third generation Mexican Americans compares to that of U.S.-born non-Latino Whites (hereafter referred to at U.S.-born Whites). Using U.S.-born Whites as a benchmark, the study observes how access measures differ for each Mexican generation. Secondly, we identify if there is improvement in access to care with each passing generation, and if so, if improvements in access of the later Mexican generations leads to an equalizing of access. 9The study uses the 2007 California Health Interview Survey (CHIS) public use file. CHIS is a random-digit-dial telephone survey of all counties in California conducted every two years. A small sample of cell phone owners with no landline are also surveyed. A complex sampling design, which includes geographic-stratification and oversampling, ensures that small counties and minority populations are represented in the sample (CHIS Methodology 2009). CHIS data is collected in English, Spanish, and several Asian languages. The final sample consists of 51,048 adults, of which 825 are cell phone owners without a landline. The 2007 CHIS has a screener completion rate of 35.5%, and 52.8% of those screened completed a full interview. These rates are comparable to similar telephone surveys (CHIS Methodology 2009). 10Analysis of this study is limited to adults ages 18 and over who identify as Latino of Mexican origin (n=7,001) and U.S.-born non-Latino Whites (n=30,615). Thus we exclude all other Latino subgroups, other racial groups and foreign-born non-Latino Whites. U.S.-born Whites serve as the comparison group since they are the dominant population and generally experience the least barriers to access and use of care. The U.S.-born White reference group consists of those born in the U.S., excluding the foreign-born generation, which may have some barriers to access because of their immigrant status. 11The study focuses on three dependent variables, all of which are yes/no dichotomous measures. Access to care outcomes include the following: being insured all or part of the past year, visited the doctor in the past year, and visited the emergency room (ER) in the past year. These measures have previously been used in the literature to measure access and use of health care (Ortega et al. 2007; Vargas Bustamante et al. 2009; Weineck et al. 2000). As a measure of access, having insurance is an enabling factor that, when available, can facilitate the use of health care services (Anderson 1995; Spatz et al. 2010). Seeing a doctor in the past year measures the ability to access and use health services, and can increase the likelihood of receiving preventive care as well as the timely treatment of chronic diseases. Visiting the ER is a measure of access to health services, albeit an undesired use because of the high costs and usual delay of care related with ER visits. Alternatively, use of the ER can be an indicator of poor access to primary care resulting from an inability to navigate the health care system.It can also be an indicator of poorer health, resulting in increased use of emergency services (Ku and Matani 2001). For this study, we expect higher levels of access to correspond with having insurance, having had a doctor visit, and visiting the ER. 12The main predictor, generational status, is constructed from a combination of variables including self-reported race/ethnicity, nativity, and parent nativity. Respondents must have self-identified as Latino of Mexican-origin or U.S.-born White. Generational status was then assigned based on the respondents’ and their parents’ place of birth. The resulting generation variable consists of four categories that distinguish between the following: U.S.-born Whites (reference); third generation Mexican Americans who are born in the U.S. and identify as Latino of Mexican origin with both parents born in the U.S.; second generation Mexican Americans who are born in the U.S. and identify as Latino of Mexican origin with at least one foreign born parent; and first generation Mexicans who are born in Mexico and identify as Latino of Mexican origin. There is no way of distinguishing the third generation from later generations, thus this category includes third and subsequent generation Mexican Americans. In addition, since coding generational status relies on self-identity, it is likely that some third and higher generation Mexican American no longer identify as Mexican Americans and are therefore missing from the analysis. 13A series of covariates are included in the logistic regression model in order to control for factors the literature indicates impact access and use of health care services (Anderson 1995; Weinick et al. 2000). These variables include: gender, age, marital status, education level, income, insurance status, and self-reported health status. Having health insurance all or part of the past year is used as a covariate for all outcomes, except when insurance is the dependent variable. Insurance can be a facilitator to health care and those with insurance will be expected to have better access and increased use of services (Anderson 1995). 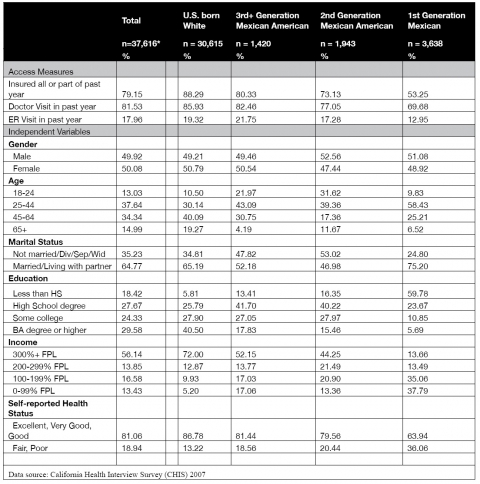 Socioeconomic status, measured here by education, income level, and insurance status, is an important factor to consider for Mexican-origin individuals because research finds differences in socioeconomic status by generational status (Acevedo-Garcia et al. 2010; Telles and Ortiz 2008). The literature identifies additional factors that impact access, such as language or citizenship status, that are not included in the final model because of the lack of variation in the second and third generations. While documentation status may be pertinent to the access of health care for first generation immigrants, this information is not available when using public use files. 14Analysis begins with descriptive statistics of all variables. Percentages for the dependent and independent categorical variables are presented for each Mexican-origin generation and U.S.-born Whites. Multivariate analysis using binomial logistic regression is conducted on each of the three access outcome variables in order to determine whether each Mexican generational status differs from U.S.-born Whites. For each dependent variable, two models are created. The first model establishes the bivariate association between generational status and the access outcome variable. The second model includes the covariates previously listed in order to examine how the generation variable changes once controlling for demographic and socioeconomic differences in the population. STATA software version 11.2 was used for all analyses (Stata 2009). The analysis uses the probability and replicate weights provided by CHIS in order to account for the complex sampling design in calculating standard errors (CHIS Methodology 2009). 15Table 1 provides descriptive statistics for the outcome and independent variables for the total sample and by generational status. About twenty percent of the total sample of adults has poor access to health care. One in five of the total sample does not have health insurance, about 18% have not seen a doctor in the past year, and 18% have had an ER visit in the past year. First generation Mexicans generally have the lowest rates of access, with increasing rates for subsequent generations. U.S.-born Whites have the highest rate of access. Access rates for second and third generation Mexican Americans fall in between, with the third generation reaching similar rates to that of U.S.-born Whites. Table 1. Weighted Percentages of Outcome Measures and Covariates by Generation, Mexican-origin and U.S.-born White Adults in California, 2007. 16The independent variables also show a trend of the first generation doing poorly with improvement for the successive generations. This is especially true of education and income. For example, the rate of a college degree is seven times higher for U.S.-born Whites than first generation Mexicans. Education and income rates for the second and third generations are much improved compared to the first generation; however, there is still a considerable gap in high education and high income between third generation Mexican Americans and U.S.-born Whites. 17Table 2 presents odds ratios and 95% confidence intervals for the access outcomes: insured, doctor visit, and ER visit. The analyses use logistic regression to control for population differences and examine the relationship between generational status and the three access outcomes. Model 1 presents the bivariate relationship between generational status and each access measure. In Model 2 we control for basic demographics, such as gender, age, and marital status; socioeconomic status (SES) as measured by education, income, and health insurance status; and self-reported health status. 18All three Mexican generational groups have statistically significant lower odds of being insured than U.S.-born Whites in the unadjusted Model 1, Table 2. First generation Mexicans have the lowest odds of being insured all or part of the year when compared to U.S.-born Whites. The odds of having insurance improve for second and third generation Mexican Americans; however, both groups are still less likely to have insurance than U.S.-born Whites, with the third Mexican American generation still having only about half the odds as U.S.-born Whites. 19Part of the disparity in being insured is a result of the compositional differences of the populations, as shown in the improved odds for all generations in Model 2. Once we control for sociodemographic differences, the third Mexican American generation has a similar rate of health insurance as the U.S.-born White reference group. However first and second generation Mexican Americans continue to have lower odds of being insured than U.S.-born Whites even when adjusting for sociodemographics. The immigrant first generation maintains the largest disparity, with less than half the odds of having health insurance compared to Whites when controlling for sociodemographics. Table 2. Logisitc Regression Models (Odds Ratios) Predicting Access (Being Insured, Doctor Visit, ER Visit) among Mexican-origin and U.S.-born White Adults in California, 2007. Weighted. n=37,565. 20Similar patterns emerge by generational status for doctor visits in the bivariate and adjusted models. In the unadjusted Model 1, Table 2, all three Mexican generational groups are less likely to have had a doctor visit than U.S.-born Whites. First generation Mexicans have the lowest odds of having a doctor visit compared to U.S.-born Whites, and each successive generation has higher odds. When we control for population differences in sociodemographics, insurance, and self-reported health status, third generation Mexican Americans emerge with similar odds of any doctor visits as U.S.-born Whites, while the first and second generations continue to have lower odds than U.S.-born Whites (Model 2). Thus, differences in sociodemographics account for variations in insurance and doctor visits for third generation Mexican Americans and Whites, but not entirely for the first and second generations. 21In the unadjusted model, only the immigrant Mexican American generation has lower odds of emergency room (ER) use compared to U.S.-born Whites (Model 1, Table 2). Once we control for differences in sociodemographics, insurance, and health status, the odds for all generations fall modestly, and the resulting pattern for ER use becomes similar as for health insurance and any doctor visit (Model 2). Both first and second generation Mexican Americans have statistically significant lower odds of visiting the ER than U.S.-born Whites. Third generation Mexican Americans have similar odds of visiting the ER as U.S.-born Whites, adjusting for sociodemographic differences. 22The aim of this study was to compare each Mexican generational status with U.S.-born Whites, focusing on the progression of access to health care across the generations. Of specific interest was whether the levels of access for the third generation were more similar to U.S.-born Whites, indicating improvement, or to the second generation Mexican Americans, indicating stagnation of progress in access to health care. We find that for all access measures (health insurance status, doctor visits, emergency room (ER) visits), third generation Mexican Americans exhibit no statistical difference from U.S.-born Whites once we control for population and sociodemographic differences. First generation Mexicans have the least access to health care, with lower odds than Whites in accessing insurance, doctor visits, and ER visits. Second generation Mexican Americans also have lower odds than Whites; however, the differences are not as pronounced as for the first generation. The covariates included in the analyses, such as age, gender, education, and income, were generally found to follow the expected patterns in the health literature. Being female, married, older, having higher education and income levels are predictive of better access to health care. The contribution and focus of this analysis is the effect of generational status on access outcomes. 23This study finds important differences in access to health care among Mexican Americans when examined by generational status, with the greatest disparities for the generations closest to the immigrant experience, the first and second generations. The native born usually do better than the foreign born, however in our study once we disaggregated the second and third U.S.-born Mexican Americans, access disparities for the second generation emerge. Other studies have found similar trends, with the first and second generation exhibiting poorer health outcomes than the third generation (Acevedo-Garcia et al. 2010; Afable-Munsuz et al. 2010; Ahmed et al. 2009). 24In the unadjusted models third generation Mexican Americans are less likely to be insured or have a doctor visit compared to U.S.-born Whites, however these differences are eliminated once we control for socioeconomic and health status. This suggests that after several generations of integration into U.S. society, third generation Mexican Americans may have enough experience with the health care system and other U.S. institutions, assuming similar educational, economic, and health backgrounds as U.S.-born Whites. The third generation may have more resources and experiences than the first or second generations that allow them to better navigate the health care system, advantages that come from being born in the U.S. and having U.S. born parents. However, persisting health access barriers between third generation Mexican Americans and U.S.-born Whites at the bivariate level are in part the result of continued educational and income disparities between the two groups, such as the poverty rate that is three times higher for third generation Mexican Americans than for U.S.-born Whites. 25We also considered differences in age cohorts between Mexican-origin Latinos and U.S.-born Whites as a possible source of the observed disparities in access to care. Second and third generation Mexican Americans are younger with a smaller older adult population compared to U.S.-born Whites, thus we performed a sensitivity analysis restricting the groups to ages 18-64. Differences in doctor visits observed between second and third generation Mexican Americans and Whites disappear after restricting the age and adjusting for sociodemographics. Thus, differences in doctor visits may be driven in part by the size of the older U.S.-born White population. However, excluding ages 65 and over from the analysis had little impact on the patterns for insurance status and ER visits, suggesting that there are differences between U.S.-born Whites and Mexican Americans by generation not accounted by age variations in the population. 26While controlling for socioeconomic status and other population variations eliminates differences in access for third generation Mexican Americans and U.S.-born Whites in our study, disparities in other related dimensions continue to exist. Research has observed educational and occupational segregation and discrimination in U.S. institutions against all Latinos, regardless of immigration status or generation (Portes and Zhou 1993; Telles and Ortiz 2008; Williams 1999). These observations are supported by legal findings that legislation at the state level allowing police to inquire about immigration status leads to racial profiling and discrimination (Bauer 2009; Cervantes et al. 1995; Sabia 2010). A variety of reasons explain the bivariate disparities in health care access and socioeconomics between Mexican Americans of all generations and U.S.-born Whites. In the short term, the ACA’s expansion of health insurance should significantly reduce the health care access disparities between third generation Mexican Americans and U.S.-born Whites; in the long-term, it is important to improve educational and occupational equity to remove the underlying basis for the access disparities for Latinos of all generations. 27This study finds that those closer to the immigrant experience, first generation immigrants and the second generation children of immigrants, have worse access to health care compared to U.S.-born Whites, even after controlling for demographics and socioeconomic status. Our findings suggest that generational status may be serving as a proxy for the broader social and structural barriers that Latinos face in accessing health care. Specifically, first generation Mexicans may face obstacles in accessing health care due to citizenship and documentation status, language barriers, and limited skills in navigating the U.S. health care system (Cordasco et al. 2011; Kandula et al. 2007; Vargas Bustamante et al. 2010). Structural factors, such as where immigrants live and the availability of quality health services, can also be barriers in accessing health care (Cordasco et al. 2011; Osypuk et al. 2009). Fear of U.S. institutions, in particular of the health care system, is another potential obstacle to accessing care for undocumented first generation Mexican immigrants and all Latinos in general. These fears may have been heightened as policy discussions for the ACA often coincide with increased anti-immigrant sentiment (Galarneau 2011). Few studies have examined the actual impact of fear and anti-immigrant policy on health care access, and those that have find less use of services or are inconclusive (Berk and Schur 2001; Spetz et al. 2000). While the ACA may provide insurance to many immigrants in California, several other factors will continue to impact their health care access and use. Undocumented immigrants, the most vulnerable among Latino immigrants and those least likely to have health insurance (Vargas Bustamante et al. 2010) will not be able to participate in the ACA, which may create or further intensify barriers for the undocumented and their families. Our study is unable to directly account for many of these social and structural factors that affect health care access for immigrants, nevertheless generational status may serve to broadly capture the barriers Mexican Americans experience. 28Second generation Mexican Americans have a demographic and socioeconomic profile that is similar to that of the third generation, but the second generation follow the access patterns of the first generation with lower odds of being insured, having a doctor visit, or having an ER visit compared to U.S.-born Whites. What might explain the differences in access between second generation Mexican Americans and U.S.-born Whites, considering that the second generation should not have the citizenship or language barriers that the first generation might encounter? Although this study accounts for education and income differences, socioeconomic status may impact the second generation in such a way that those with low education and low incomes are at a greater disadvantage when accessing and using health care than those within the second generation with higher incomes and education. Other studies have found varying socioeconomic gradients between generations, which may not have been captured in this study (Acevedo-Garcia et al. 2010; Ahmed et al. 2009). 29There are additional factors that impact access to health care for the second generation that we have not been able to address in our study. These factors may include residence in segregated neighborhoods, experiences with discrimination, or poor quality of care (Ahmed et al. 2009; Smedley et al. 2003; Viruell-Fuentes 2007). Additionally, considering segmented assimilation theory the second generation may be experiencing limited social mobility, which would impact their educational and occupational opportunities. A segmented labor force may place the second generation at a disadvantage with low-paying jobs with minimal health benefits or sick leave (Valenzuela Jr. and Gonzalez 2000), discouraging them from seeking care. Residence in segregated neighborhoods can result in less availability of services or poorer quality of care for the second generation, deterring access to services (Acevedo-Garcia et al. 2003). Having an immigrant parent may impact the social and human capital of the second generation (Portes and Rumbaut 2001), resulting in limited knowledge or resources in navigating the health care system. Future studies should consider the social context for the second generation and the experiences that may be impacting their access to care. Using a life course perspective may be especially useful for the second generation as barriers experienced in early life as the children of immigrants, such as limited socioeconomic status or limited family and neighborhood resources, may last into adulthood and impact access to health care. 30The results of this study should be considered within the context of several limitations. The CHIS is a cross-sectional survey, which limits the establishment of a causal relationship between generational status and access to health care measures. There may be other variables that we have not considered that confound the possible effect of generation on access to health care. Additionally, all access measures are self-reported, leaving the dependent variables prone to historical inaccuracies and response bias. The findings are specific to California, which has historical and policy differences from other states that might result in varying access patterns. There may also be third generation Mexican Americans that no longer identify with being of Mexican or Latino descent, which would result in excluding the most assimilated from the analysis. However, excluding the most assimilated from the study strengthens our findings of the third generation having access patterns similar to U.S.-born Whites, even without those who are most assimilated. 31Despite the limitations, this is one of a few studies to examine access to care and the role of generational status among Mexican Americans, specifically including the third generation. While generational status is not a new dimension of research in immigrant health, this study is able to further disaggregate the U.S.-born population by generation. Additionally, the study is based on the California Mexican-origin population, a state with one of the largest concentration of Latinos. Results from this study may anticipate the health trends for Latinos at the national level. 32This study finds that those closest to the immigrant experience, specifically Mexican immigrants and U.S.-born Mexican Americans of immigrant parents, have the lowest rates of health insurance and utilization of health care. There are several policy recommendations that can be enacted immediately and over the long term to address the access barriers of these populations. The Affordable Care Act (ACA) presents a unique opportunity to extend health insurance coverage to an unprecedented number of individuals. Estimates predict that between 1.8 and 2.7 million individuals will be able to receive health insurance through the ACA in California; however several groups will still remain uninsured, for example segments of the Latino population or some Californians with limited English abilities (Lucia et al. 2012). Specific strategies and policies can be implemented now in order for the ACA to incorporate the largest amount of eligible individuals. Based on our findings, third generation Mexican Americans may benefit the most from health care reform since the elimination of socioeconomic barriers improves health insurance status and access to care most for this group. First and second generation Mexican Americans may not fare as well as the third generation and require additional assistance to improve access. 33Most significantly, access may be improved through the ACA with focused and increased outreach to the Mexican American groups with the least access, the first and second generations. Reaching out to these groups and informing them of ways in which they may be eligible for the ACA can increase access to health insurance. Outreach will need to be available in both English and Spanish and dispel any fears for immigrants involved with the residency process or those belonging to mixed families (Gomez and Artiaga 2011). In addition to education and outreach for ACA eligibility, issues of navigating the health care system will also need to be addressed. Mexican immigrants may be unfamiliar with the health care system in the U.S. and Mexican Americans born to immigrant parents may lack the knowledge and capital if they were not exposed to the health care system across their lifespan. 34Outreach and education is critical, but just as important is who is providing the information. Established ethnic organizations and trusted community programs will be instrumental in providing ACA outreach for immigrants and second generation Mexican Americans, as well as with improving navigation of the health care system (Gomez and Artiaga 2011). Community health workers, or promotoras, have long been used in the Latino population to improve outreach and program implementation because of the trust and cultural capacity brought by the community health workers (Elder et al. 2009; Swider 2002). Use of community organizations will be important to increase the number of applicants to the ACA and to increase the use of appropriate health care utilization by first and second generation Mexican Americans. 35Also, as with any recent policy implementation, the application process can be new and confusing. Streamlining the application process and simplifying the documentation needed to apply, especially for Medicaid, can facilitate access to health insurance for first and second Mexican Americans, and all eligible individuals (Gomez and Artiaga 2011). While community organization can provide assistance and set up processes that work on the ground, state and federal governments will need to ensure that ACA information is available and provided in accessible formats for all individuals, including for those with limited education levels or with limited English language abilities. Additionally, support for safety net clinics will be critical to provide continued access to low-income and racial/ethnic minority populations (Andrulis and Siddiqui 2011). 36In addition to the implementation of the ACA, other policies will be needed over time to promote equity of access for first and second generation Mexican Americans. For the generations closest to immigration, additional factors beyond health insurance and socioeconomic status impact access to health care. Addressing quality of care, discrimination within the health care system, and educating first and second generation Mexican Americans of their eligibility to benefits and health programs may improve health care access in the immediate term. Improving educational and occupational opportunities for immigrants and their children will be critical to improving health and access for current and future generations. 37We find generational status to be a significant predictor to accessing health care services. Specifically, first and second generation Mexican Americans are less likely to have insurance, see a doctor, and visit the ER than U.S.-born Whites. Despite the differences in access by generational status, policies rarely address the unique factors that distinguish the Latino immigrant and U.S.-born population. This study finds that even when adjusting for sociodemographics, generational status remained a predictor for health insurance, limited doctor and ER visits. Further research into the unique experiences of each generation, especially the second generation, can provide a better understanding as to why some groups continue to face obstacles in accessing health care. However several strategies can be implemented to address the access barriers of first and second generation Mexican Americans, in particular when considering the implementation of Affordable Care Act. 38We thank Vilma Ortiz for her valuable comments to an early version of the paper. Helpful comments were also provided by Xóchitl Castañeda and Shannon Gleeson. 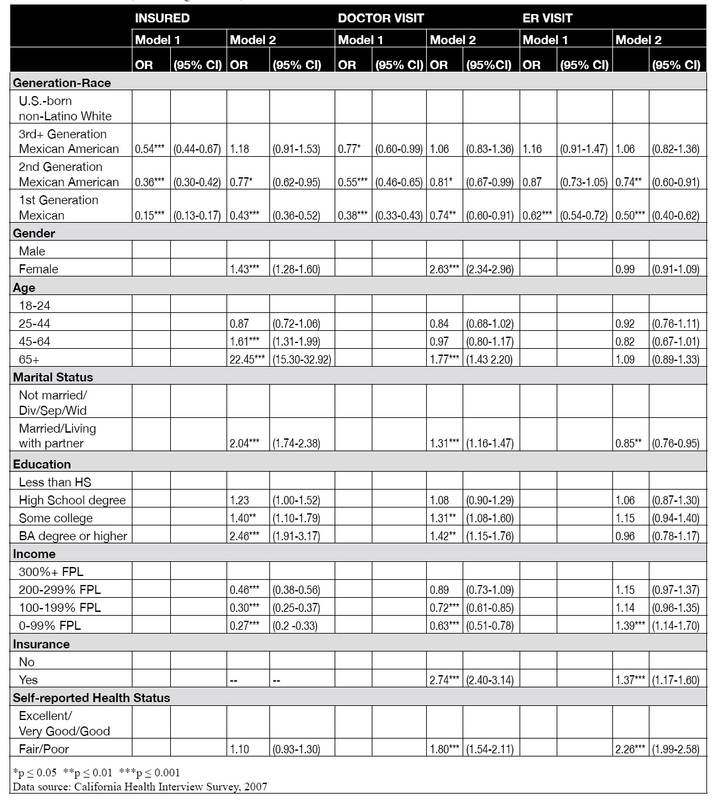 Acevedo-Garcia, D., Bates, L. M., Osypuk, T. L., and N. McArdle (2010), “The Effect of Immigrant Generation and Duration on Self-rated Health Among U.S. Adults 2003-2007”, Social Science & Medicine, Vol. 71, pp.1161-1172. Acevedo-Garcia, D., Lochner, K. A., Osypuk, T. L., and S. V. Subramanian (2003), “Future Directions in Residential Segregation and Health Research: A Multilevel Approach”, American Journal of Public Health, Vol. 93, No. 2, pp. 215-221. Afable-Munsuz A., Ponce, N. A., Rodriguez, M., and E. J. Perez-Stable (2010), “Immigrant Generation and Physical Activity Among Mexican, Chinese & Filipino Adults in the US.” Social Science & Medicine, Vol. 70, No. 12, pp. 1997-2005. 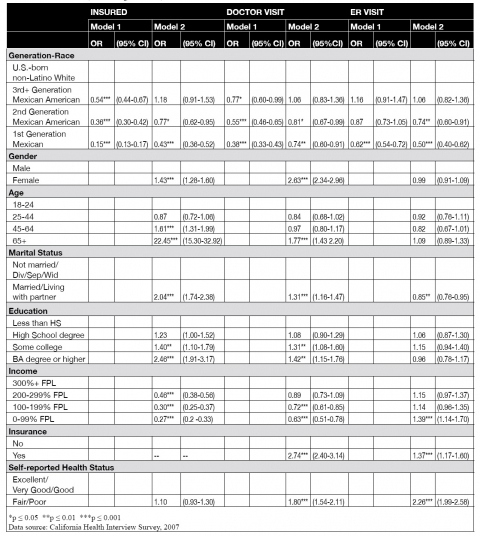 Ahmed, A. T., Quinn, V. P., Caan, B., Sternfield, B., Haque, R., and S. K. Van Den Eeden (2009), “Generational Status and Duration of Residence Predict Diabetes Prevalence Among Latinos: the California Men's Health Study”, BMC Public Health, Vol. 9, 392. Anderson, R.M. (1995), “Revisiting the Behavioral Model and Access to Medical Care: Does it Matter?”, Journal of Health Social Behavior, Vol. 36, pp. 1-10. Andrulis, D. P., and N. J. Siddiqui (2011), “Health Reform Holds Both Risks and Rewards for Safety-Net Providers and Racially and Ethnically Diverse Patients”, Health Affairs, Vol. 30, No. 10, pp. 1830-1836. Bauer, M. (2009), “Under Siege: Life for Low-Income Latinos in the South”, The Southern Poverty Law Center, accessed February 2012 at www.splcenter.org/sites/default/files/downloads/UnderSiege.pdf. Berk, M. and C. Schur (2001), “The Effect of Fear on Access to Care Among Undocumented Latino Immigrants”, Journal of Immigrant Health, Vol. 3, No. 3, pp. 151-156. Burgos, A. E., Schetzina, K. E., Dixon, L. B., and F. S. Mendoza (2005), “Importance of Generational Status in Examining Access To and Utilization of Health Care Services by Mexican American Children”,Pediatrics, Vol. 115, No. 3, pp. e322-30. California Health Interview Survey (2007), accessed on August 2011 at www.askchis.com. California Health Interview Survey (2009), “CHIS 2007 Methodology Series: Report 4 – Response Rate”, Los Angeles, CA: UCLA Center for Health Policy Research, accessed August 2011 at www.askchis.com/pdf/CHIS2007_method4.pdf. Carrasquillo, O., Carrasquillo, A., and S. Shea (2000), “Health Insurance Coverage of Immigrants Living in the United States: Differences by Citizenship Status and Country of Origin.” American Journal of Public Health, Vol. 90, No. 6, pp. 917-923. Cervantes, N., Khokha, S., and B. Murray (1995), “Hate Unleashed: Los Angeles in the Aftermath of Proposition 187”, Chicano-Latino Law Review, Vol. 17, No. 1, pp. 1-23, http://heinonline.org/HOL/Page?collection=journals&handle=hein.journals/chiclat17&type=Image&id=13. Cordasco, K. M., Ponce, N. A., Gatchell, M. S., Traudt, B., and J. J. Escarce (2011), “English Language Proficiency and Geographical Proximity to a Safety Net Clinic as a Predictor of Health Care Access”, Journal of Immigrant and Minority Health, Vol. 13, No. 2, pp. 260-267. Elder, J. P., Ayala, G. X., Parra-Median, D., and G. A. Talavera (2009), “Health Communication in the Latino Community: Issues and Approaches”, The Annual Review of Public Health, Vol. 30, pp. 227-251. Galarneau, C (2011), “Still Missing: Undocumented Immigrants in Health Care Reform”, Journal of Health Care for the Poor and Underserved, Vol. 22, pp. 422-428. Gomez, O. C., and Artiaga, S (2011), “Connecting Eligible Immigrant Families to Health Coverage and Care: Key Lessons from Outreach and Enrollment Workers”, The Kaiser Commission on Medicaid and the Uninsured, available at www.KFF.org/KCMU, No. 8249. Kandula, N. R., Lauderdale, D. S., and D. W. Baker (2007), “Differences in Self-Reported Health Among Asians, Latinos, and Non-Hispanic Whites: The Role of Language and Nativity”, Annals of Epidemiology, Vol. 17, No. 3, pp. 191-198. KFF (2011), “Summary of New Health Reform Law”, Focus on Health Care, Kaiser Family Foundation, accessed August 2011 at www.kff.org/healthreform/upload/8061.pdf. Ku, L. and S. Matani (2001), “Left Out: Immigrants’ Access To Health Care And Insurance”, Health Affairs, Vol. 20, No. 1, pp. 247-256. Lara, M., Gamboa, C., Kahramanian, M. I., Morales, L. S., and D. E. Hayes-Bautista (2005), “Acculturation and Latino Health in the United States: A Review of the Literature and its Sociopolitical Context”, Annual Review Public Health, Vol. 26, pp. 367–397. Lucia, L., Jacobs, K., Dietz, M., Graham-Squire, D., Pourat, N., and D. H. Roby (2012), “After Millions of Californians Gain Health Coverage under the Affordable Care Act, who will Remain Uninsured?”, accessed October 2012, http://laborcenter.berkeley.edu/healthcare/aca_uninsured12.pdf. Morales, L. S., Lara, M., Kington, R. S., and R. O. Valdez (2002), “Socioeconomic, Cultural, and Behavioral Factors Affecting Hispanic Health Outcomes”, Journal of Health Care for the Poor and Underserved, Vol. 13, No. 4, pp. 477-503. Ortega, A. N., Fang, H., Perez, V. H., Rizzo, J. A., Carter-Pokras, O., Wallace, S. P., and L. Gelberg (2007), “Health Care Access, Use of Services, and Experiences Among Undocumented Mexicans and Other Latinos”, Archives of Internal Medicine, Vol. 167, No. 21, pp. 2354-2360. Osypuk, T. L., Diez Roux, A. V., Hadley, C., and N. R. Kandula (2009), “Are Immigrant Enclaves Healthy Places to Live? The Multi-Ethnic Study of Atherosclerosis”, Social Science & Medicine, Vol.69, pp. 110-120. Pew Hispanic Center (2011), “The Mexican-American Boom: Births Overtake Immigration”, accessed August 2011, http://pewhispanic.org/files/reports/144.pdf. Popkin, B. M. and J. R. Udry (1998), “Adolescent Obesity Increases Significantly in Second and Third Generation U.S. 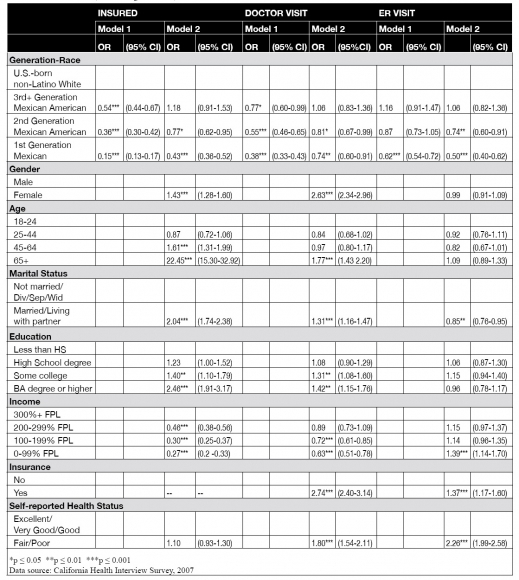 Immigrants: the National Longitudinal Study of Adolescent Health”,The Journal of Nutrition, Vol. 128, No. 4, pp. 701-706. Portes, A. and R. Rumbaut (2001), Legacies: The Story of the Immigrant Second Generation,University of California. Portes, A. and M. Zhou (1993), “The New Second Generation: Segmented Assimilation and Its Variants.” Annals of the American Academy of Political and Social Science, Vol.530, pp. 74-96. Pourat ,N., Kinane, C. M., and G. F. Kominski (2011), “Who Can Participate in the California Health Benefit Exchange? A Profile of Subsidy-Eligible Uninsured and Individually Insured”, Los Angeles, CA: UCLA Center for Health Policy Research, accessed August 2011 at www.healthpolicy.ucla.edu/pubs/files/benefitexchange-may2011.pdf. Pourat, N., Martinez, A. E., and G. F. Kominski (2011), “Californians Newly Eligible for Medi-Cal under Health Care Reform”, Los Angeles, CA: UCLA Center for Health Policy Research, accessed August 2011 at www.healthpolicy.ucla.edu/pubs/files/medicalpb-may2011.pdf. Rumbaut, R. G. (2004), “Ages, Life Stages, and Generational Cohorts: Decomposing the Immigrant First and Second Generations in the United States”, International Migration Review, Vol. 38, No. 3, pp. 1160-1205. Sabia, D. (2010), “The Anti-Immigrant Fervor in Georgia: Return of the Nativist or Just Politics as Usual?”, Politics & Policy, Vol. 38, No.1, pp. 53-80. Smedley, B. D., Stitch, A. Y., and A. R. Nelson (2003), Unequal Treatment: Confronting Racial and Ethnic Disparities in Health Care, The National Academies Press, Washington DC. Spatz, E. S., Ross, J. S., Desai, M. M., Canavan, M. E., and H. M. Krumholz (2010), “Beyond Insurance Coverage: Usual Source of Care in the Treatment of Hypertension and Hypercholesterolemia. Data from the 2003-2006 National Health and Nutrition Examination Survey”, American Heart Journal, Vol. 160, No.1, pp. 115-121. Spetz, J., Baker, L., Phibbs, C., Pedersen, R., and S. Tafoya (2000), “The Effect of Passing an ‘Anti-immigrant’ Ballot Proposition on the Use of Prenatal Care by Foreign-Born Mothers in California”, Journal of Immigrant Health, Vol. 2, No. 4, pp. 203-212. Stata, (2009). College Station, Texas. Stata Corporation. Swider, S. M. (2002), “Outcome Effectiveness of Community Health Workers: An Integrative Literature Review”, Public Health Nursing, Vol. 19, No. 1, pp. 11-20. Ta, V. M., Holck, P., and G. C. Gee (2010), “Generational Status and Family Cohesion Effects on the Receipt of Mental Health Services Among Asian Americans: Findings from the National Latino and Asian American Study”, American Journal of Public Health, Vol. 100, No. 1, pp.115-121. Telles, E. E. and V. Ortiz (2008), Generations of Exclusion: Mexican Americans, Assimilation, and Race, Russell Sage Foundation. Valenzuela Jr, A. and E. Gonzalez (2000), “Latino Earnings Inequality: Immigrant and Native-born Differences”, Prismatic Metropolis: Inequality in Los Angeles, Russell Sage Foundation, pp. 249-278. Vargas Bustamante, A., Fang, H., Rizzo, J. A., and A. N. Ortega (2009), “Understanding Observed and Unobserved Health Care Access and Utilization Disparities Among U.S. Latino Adults”, Medical Care Research and Review, Vol. 66, pp. 561-577. Vargas Bustamante, A., Fang, H., Garza, J., Carter-Pokras, O., Wallace, S. P., and J. A. Rizzo (2010), “Variations in Healthcare Access and Utilization Among Mexican Immigrants: The Role of Documentation Status”, Journal of Immigrant and Minority Health, Vol. 66, pp. 561-577. Viruell-Fuentes E. A. (2007), “Beyond Acculturation: Immigration, Discrimination, and Health Research Among Mexicans in the United States”, Social Science & Medicine, Vol. 65, pp. 1524-1535. Wallace, S. P., Gutierrez, V. F., and X. Castaneda (2008), “Access to Preventive Services for Adults of Mexican Origin”, Journal of Immigrant and Minority Health, Vol. 10, pp. 363–371. Williams, D. R. (1999), “Race, Socioeconomic Status, and Health: The Added Effects of Racism and Discrimination”, Annals New York Academy of Sciences, Vol. 896, pp. 173-188.